Our parade/walking krewe rolling through the Quarter. This was taken last year or the year before. It was warm then. Last Tuesday I was put to the test. I was pushed to the edge of my physical and emotional limits. I didn’t participate in a triathlon. Or even host a dinner party (we all know how trying that can be). I was in New Orleans for Mardi Gras. Yep. Three fun filled days in the Crescent City. I learned some things during those three days and I’d like to share them with you now. But before I do that, I must dispel some of the New Orleans Mardi Gras myths. 1. You need to show some skin to get beads. I’m not sure why this myth continues to be perpetuated, but it is the furthest thing from the truth, unless you’re on Bourbon Street. But even then you can score beads without flashing anyone. In reality, you’ll get way more goodies during the family friendly parades that run throughout the city. We’ve gotten so many beads we’ve left bags of them behind and I’ve never lifted my shirt once. There, I just had to get that off my chest (hehe). 2. Mardi Gras is an adults only event. This is totally untrue. Kids line the streets of the parade routes and dress in costume just like the adults. And you’re actually more likely to get good beads and stuffed animals if you have kids with you. No one can resist their cute little faces. A lovely aquatic family out for a stroll. You might wonder why you would need so many beads and stuffed animals. I once wondered the same thing, but now I know the answer: for your Mardi Gras tree, of course. We left our Christmas tree up and covered it with Mardi Gras beads and some of our best catches. It’s quite festive. 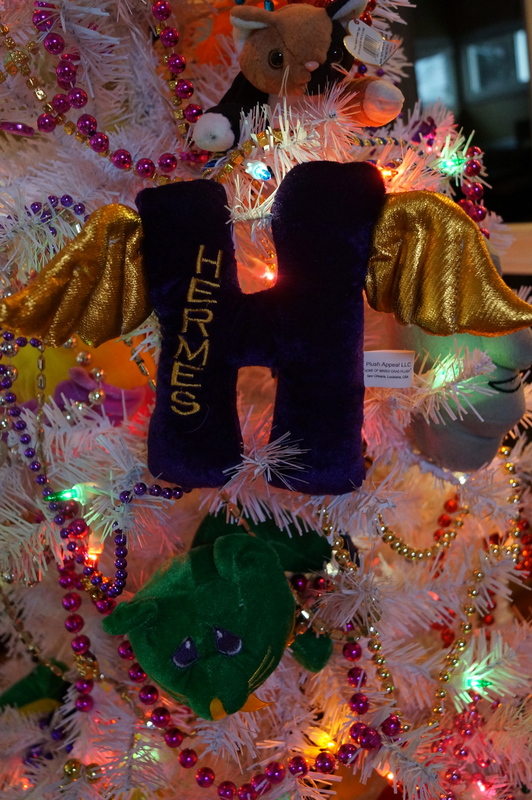 Our plush Hermes H that we caught last year. 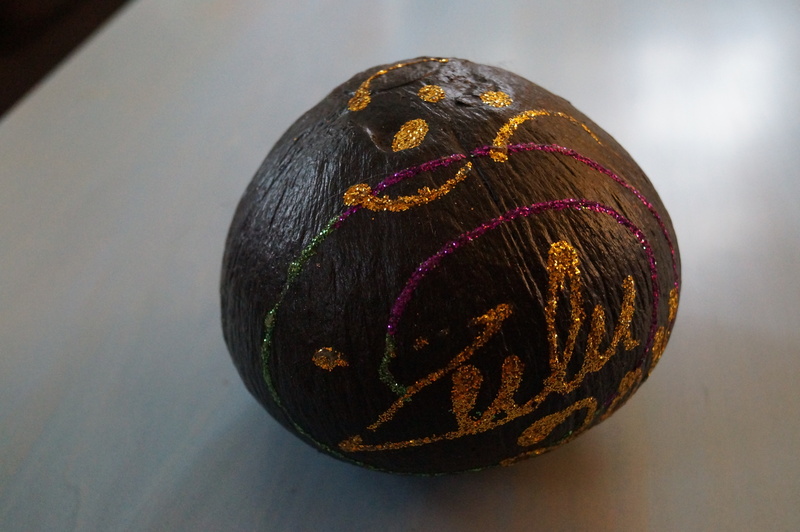 This is a prized possession: the Zulu coconut. It’s not a real coconut, but it’s still really cool. I was handed this during the Muses parade last year. 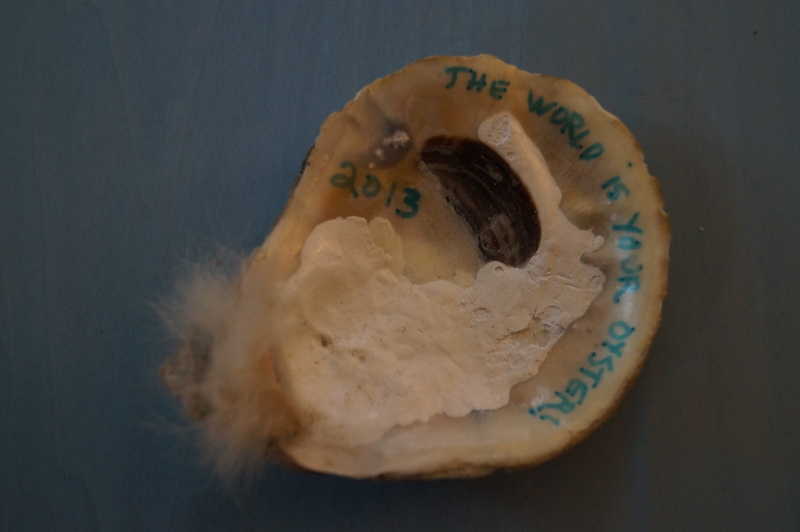 It says “the world is your oyster.” Another a prized possession. 3. It’s always warm in the South. Ha! The South can be colder than Denver, Colorado. Nobody wants to believe me when I say such things, but it’s true. Denver is dry and has more sunshine. A sunny 45-50F day and you might be outside in a tee shirt (well maybe not me, I’m a bit of a wimp). In New Orleans, I’m usually wearing my winter coat, with a sweater and long underwear. I love how the frog is just sitting there like it’s totally normal for a frog to be at the bar. 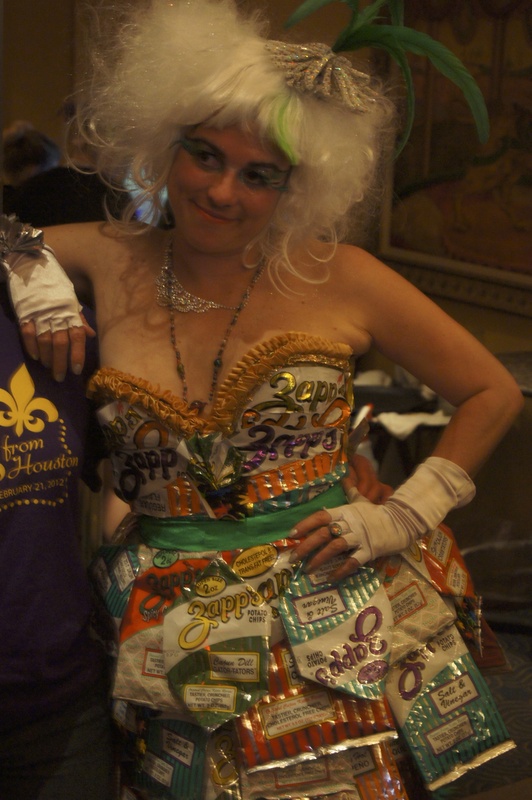 Yes, that is a dress made out of chip bags. 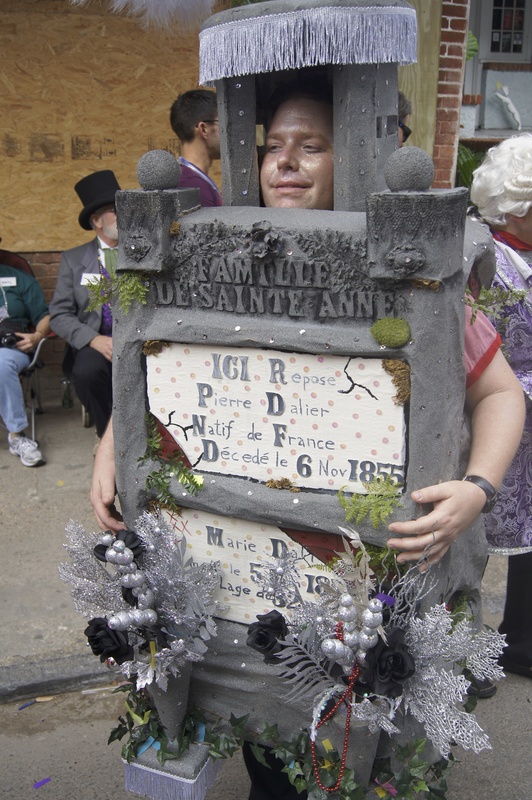 A very creative New Orleans tombstone/crypt. This crawfish was part of a crawfish boil and was wheeled around the city in a giant pot. The dog is not part of the boil. He was dressed as astronaut and either got tired or there were too many people around so he ended up in the pot too. 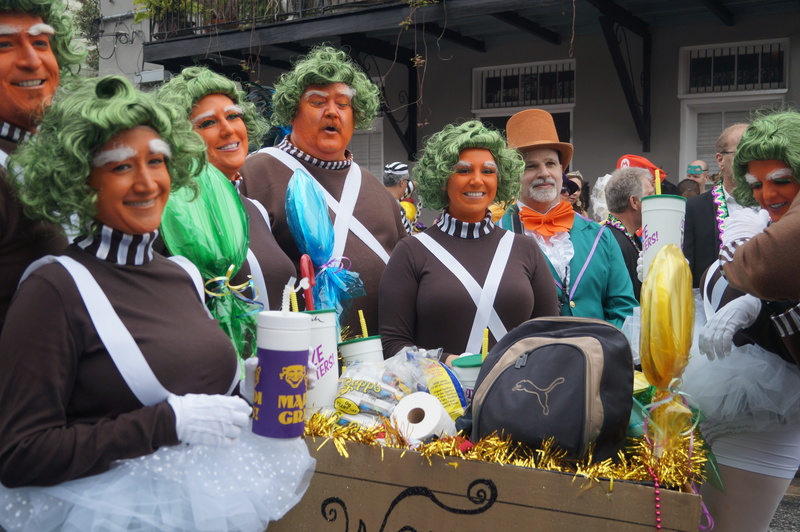 A gaggle of Oompa Loompas. My cousin Lindsay and her fiancé dressed as the Queen of Hearts and Mad Hatter. They found another queen so we had to snap a picture. 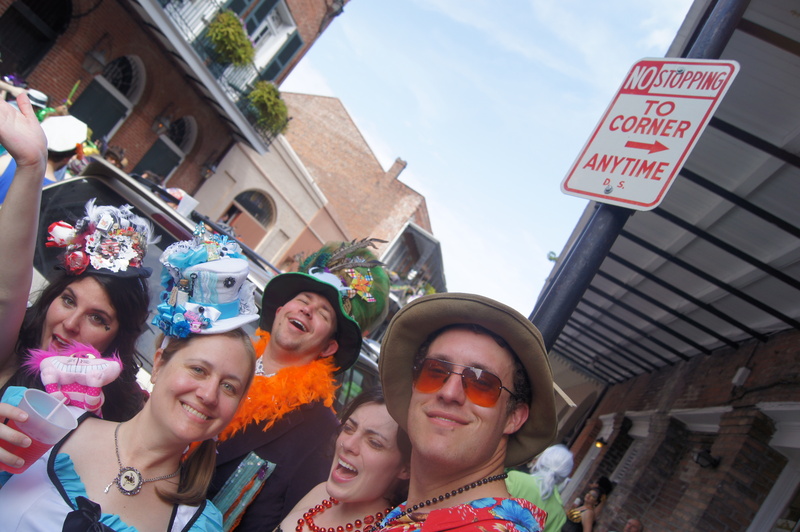 Parade members stopping for a break in the French Quarter. 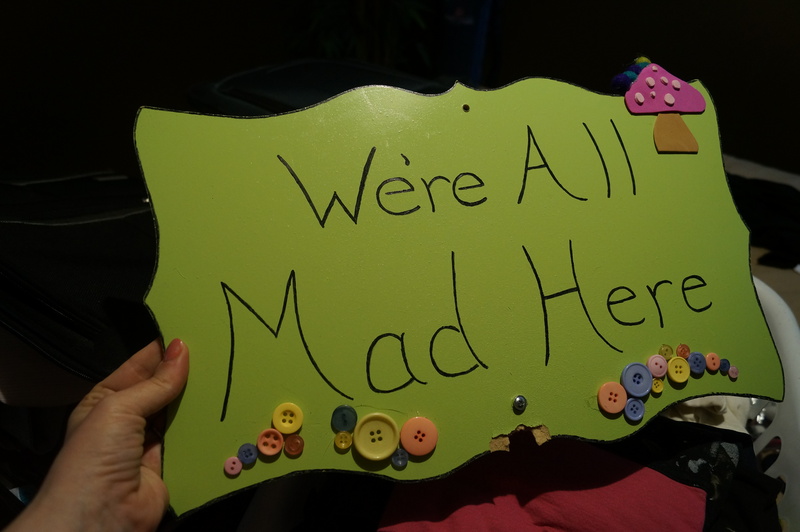 So, we decided to recycle our costumes from two years ago and went as Alice in Wonderland and the White Rabbit, but I needed something to embellish my costume. I couldn’t wear the exact same thing I’d worn two years ago. It would be like wearing the same dress to the Oscars twice. Insanity, right? Our versions of Alice in Wonderland and the White Rabbit. This is where I will share what I’ve learned. Lesson #1 – Even though I’m usually right, every now and then my husband is right. So, to embellish my costume, I decide I want a sign. After a little prodding, my husband very begrudgingly builds it and I decorate it (because no one wants a bland sign). Over and over he repeats that he “will not carry the sign.” He insists that he will end up holding it, and he refuses to. I, of course, roll my eyes while he isn’t looking. Does he really think I’m so lazy that I can’t carry a 4 lb sign? That I will become tired of holding the masterpiece I’d worked so hard on? Well, he is wrong. I am going to dance with the sign and wave it proudly over my head. It will be in all of our pictures. He is going to be soooooo thankful I made that sign! But there is one problem. It’s freezing outside. I gaze sadly out our hotel window at 9:00 in the morning and the streets are deserted. I slide an extra layer of leggings over my pantyhose and wear two long sleeve shirts under my dress. We step out of the hotel and immediately go back for my coat. Then, three blocks later we buy umbrellas. Now I’m carrying my sign and the umbrella. We make it to Frenchman street and everyone is packed inside the bars. Usually there are people partying in the streets. But not today. 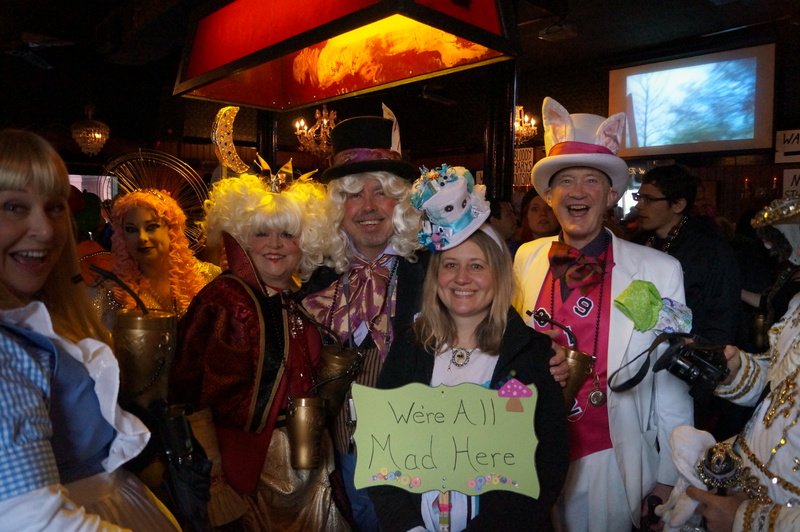 We meet these nice folks, though, also dressed as Alice in Wonderland. About an hour later our parade arrives. Oh, yeah. That’s the other thing. We’ll be marching with the St. Anthony Ramblers. Outside. For like 4 hours. By that time my husband has relieved me of the sign and fastened it to his belt. He says, “I told you so” only a few dozen times. Sadly, my beautiful sign is only in one picture. And no one was thankful I’d made it. Lesson #2 – You can rain on my parade. We march from the Marigny to the French Quarter with the brass band playing. We dance. We laugh. Occasionally, we huddle inside for warmth. We see people we have’t seen in over two years and we make new friends. 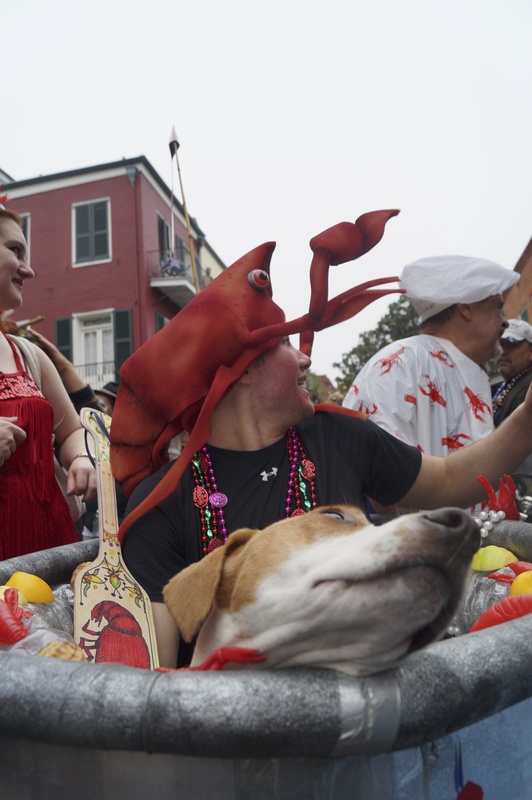 It becomes what Mardi Gras always has been for me: A chance to live in the moment. A chance to forget everything and not think about what you have to do a week from now or even an hour from now. A chance to just be happy and celebrate. Like this. Look at the joy on these faces. Soon there is ice forming on my husband’s cup, surrounding his fingers. And my toes are completely numb. In case you’re wondering it was 39 F. The record low for Fat Tuesday was 38 F, set back in 1899. But we came out and celebrated all the same. We didn’t let the cold and rain stop us. Lesson #3 – But next time, I will pack a warmer costume just in case. Like a yeti, or an eskimo or lumberjack. Lesson #4 – Remember to always look on the bright side. Moving forward, it’s likely that we’ll never have weather this cold and icky again. So, it can only get better from here. Lesson #5 – This will be one of those days we always remember. It’s like when you’ve got this vision of the perfect day and then things don’t turn out like you planned, but now you’ll always remember the day you froze on Mardi Gras. See how I can spin things so positively! P.S. This is what the sign looked like at the end of the day. See the broken spot on the bottom. That’s where the handle used to be attached to the sign. He always had it out for that sign. Super costume and photos, Jennifer. What a memorable experience. Sounds like a fabulous time. I’d love to visit New Orleans. Talk about a visual feast! It’s an amazing city, everyone is so nice, and they are constantly celebrating something. You should check it out! See, I knew I’d be carrying that sign… It’s funny that the worst conditions for Mardi Gras this year will not only further solidy my love affair with the Carnival, but also the great people of New Orleans and their fabulous city. So happy to see a post from you. Yes, the South gets cold, and it rains—when it’s cold. And the wind blows, which makes it colder. Looks like you had a great time, mishaps and all. I love the costumes, and the sign. Ugh. I was bogged down with work for a couple of weeks, but hopefully I won’t let myself “disappear” again. Thank you for nice words about the sign. It was very necessary and would have been fabulous if it weren’t for that dang umbrella competing for attention. And, by the way, I carried the umbrella all day … so one could assume that I would have carried the sign all day, had I not had the umbrella. About an hour ago, maybe I should publish it again? Have you ever had that happen? No, I’ve never had it happen but I know weird things happen sometimes. In my reader, it looks like my post is published twice. I just checked in my reader again and I don’t see it. I would publish it again. And my reader is jumping from 1day ago to 9days ago, maybe that has something to do with it? Sorry I dropped off the face of the earth. Work got a little crazy on me! I’m glad everyone keeps remarking on the sign. I plan to show my husband and say, “see everyone loves the sign!” Oh, this reminds me, I have to come over to your blog and make a comment about the Thirteenth Tale – I finally read it! No worries, life takes over sometimes. Wow that’s great to hear about the Thirteenth Tale – I’m so glad you finally got around to it! Yes I know that problem well! You had me smiling from the oyster to the frog at the bar to the dog in the crawfish boil, too funny. You are right about Denver, I have had to use the air conditioner in my car the past two days because of the sun even though the temperature was only about 65! I love the sign and think it should be hanging in your house, for obvious reasons, and I mean that in the sweetest way possible. I love the dog in the crawfish boil. He was so calm like it was an everyday occurrence that he was wheeled around the city in a giant pot with thousands of people around him. That’s awesome. Sounds like you guys had a down-the-rabbit-hole-awesome time. I love NO. I have family there, and get there every couple of years, but never during Mardi Gras. I’m jealous. Glad to see you back, madame. It’s about freakin time. That’s awesome that you have family there. It is one of my favorite cities. Never been there in the summer, though. That might change my mind – not a fan of the humidity and giant bugs. One day I hope to get there for Mardi Gras. Seems like it would be so much fun. And based on your review, I shouldn’t shy away from taking my family, I guess. I am totally jealous! I will be heading out to New Orleans soon, but I have never seen it in its Mardi Gras splendor. 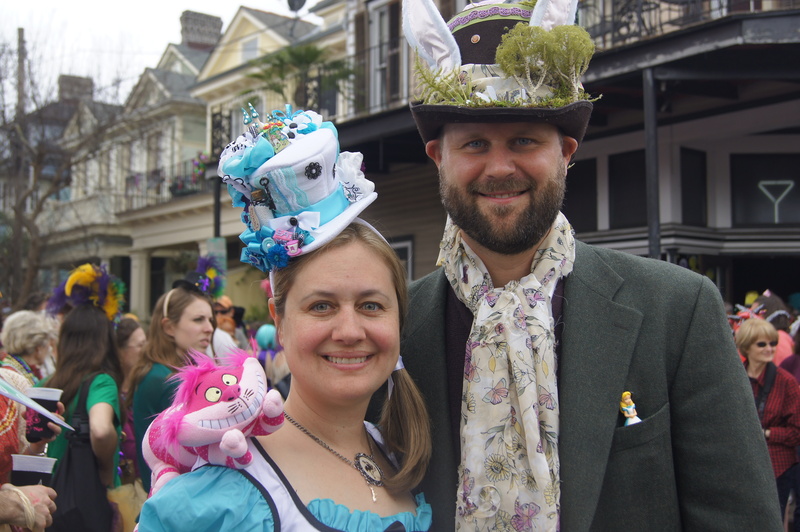 You should definitely check out Mardi Gras, especially if you enjoy making and wearing costumes. It was an awesome and freezing day. And I’m a wimp when it comes to cold, so I really do need to plan for warmer costumes in the future. That sounds like so much fun! I’ve been to Carnival in Cologne, where the whole city (and everyone on the train) was in fancy dress, and it’s such a great experience. 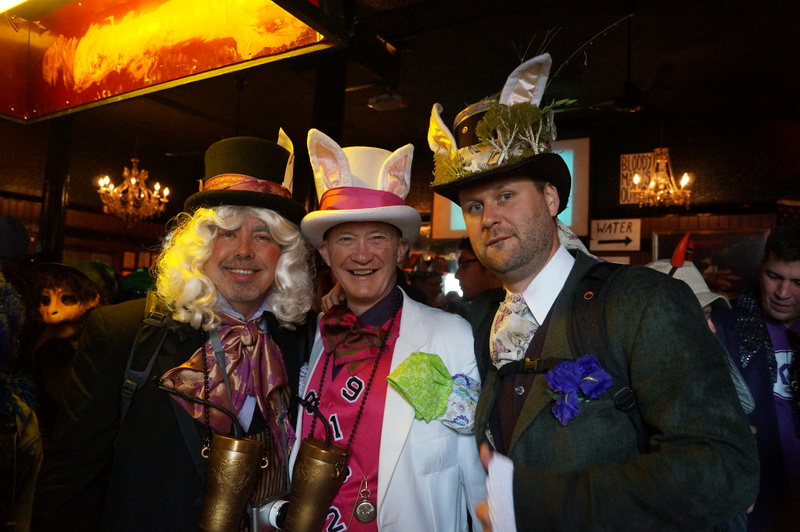 It’s very easy to strike up conversation with fellow pirates/superheroes/witches/mad hatters! 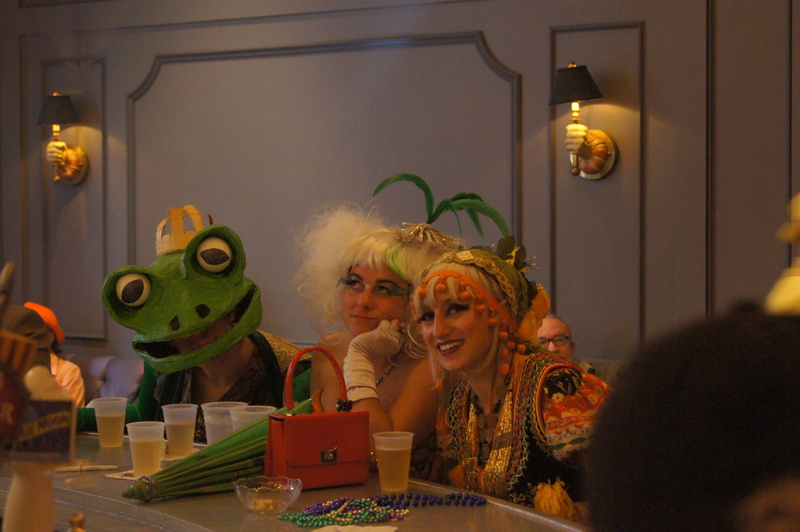 I love the frog in the bar (does he only come out for Mardi Gras or is he there all year, I wonder…), and that dog is just going with the flow. 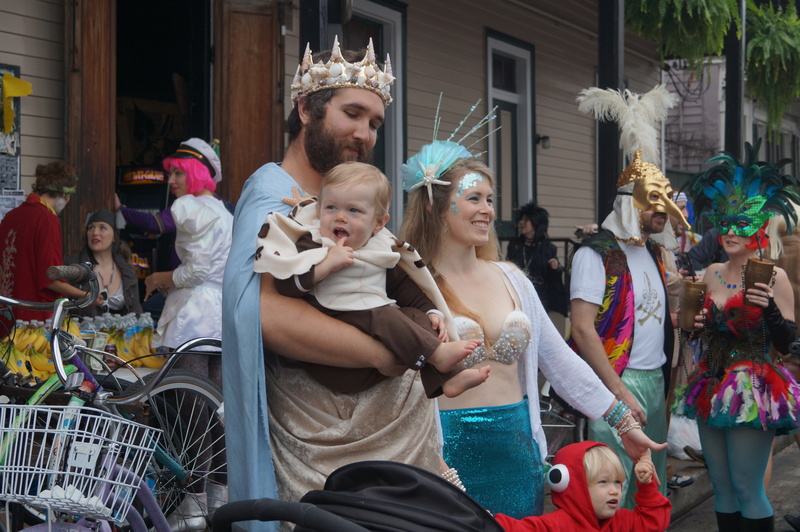 Okay, I have now added “Attend New Orleans, Mardi Gras – dressed as a mermaid” to my “things to do” list. Yes! It does make you a little more outgoing. I think that’s another reason I enjoy it – I can almost take on a whole new persona. Growing up I seriously thought New Orleans was the only place in the world that celebrated Mardi Gras. Then I learned about more carnival and realized so much of the world celebrates Mardi Gras. Carnival in Cologne sounds like it was a blast. I may have to venture out and experience the festivities in other cities. Oh, New Orleans. My other love. What an amazing time we had. It was freezing and I’m sorry I missed out on the parade…but glad we had so much fun. Two years from now, I predict it will be warm and we will all be there having the time of our lives…again! 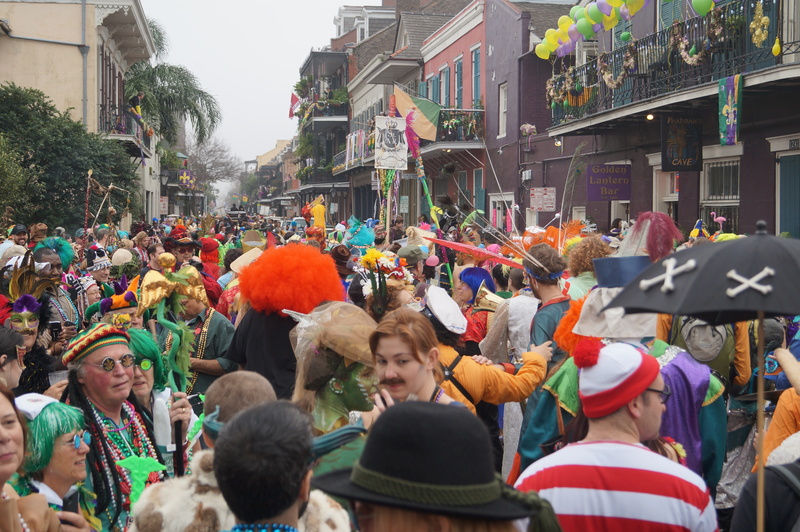 Great post, there are sooooo many misconceptions about Mardi Gras. I’m glad you finally disproved them all. I like your prediction. I’m getting the same feeling. Remember it can only get better. Eeeks! So far away, yet I’m already so excited. Jennifer Windram has just disproved all of the myths of Mardi Gras. Thought I should share this hilarious post. Also, you can see what a great time we always have with our tiny hats. Thank you for appreciating my sign. It’s just sitting the spare bedroom right now, all lonely. I sort of feel bad for it. My wife always has to take her purse with her when she goes out and always leaves it behind. Good Samaritans always find a way to get it back to her, but someday it will be empty of cash and credit cards. I tell her to leave it behind but she just has to have it. I guess what I am trying to say is that I feel your husbands pain regarding the sign. Also, I feel better reading this knowing that I won’t have to flash people to get beads when I go to Mardi Gras. Some people can’t help themselves, but I feel it’s best to keep your clothes on. Her favorite purse is bright red so I am sure I will show up on someone’s blog if I carry it. But that isn’t a bad idea – at least it won’t get lost.